Someone searching this blog for information on chemtrails was disappointed to find nothing, so here is a long video by chemtrail researcher Clifford Carnicom who claims that since the early part of 1999, substances have been sprayed in the atmosphere. How much is true? All of it? None of it? My understanding is that the temperature of the atmosphere at different altitudes causes condensation from jets to stick around or not. So, at one altitude a jet would leave a trail, and at another, the trail would evaporate. I would not be surprised if some chemicals are being dumped in the sky. The solution to pollution is dilution. Some massive secret weather modification program seems pretty far fetched, but I think, not impossible. This documentary produced by chemtrail researcher Clifford Carnicom is a must see and an excellent research tool. Five plus years into the operations has provided ample evidence in this 90min DVD that covers many topics. Over the years aerosol/chemtrail research has provided some leads but even more questions as to who and why the spraying occurs. It is clear jets are deliberately spraying the sky’s and it will not stop until enough people are aware and willing to stand up for the operations exposure and termination. 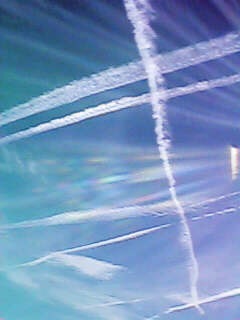 In Britain, when the Secretary of State for Environment, Food and Rural Affairs was asked “what research her Department has undertaken into the polluting effects of chemtrails for aircraft”, the response was that “the Department is not researching into chemtrails from aircraft as they are not scientifically recognised phenomena.” An IPCC special report AVIATION AND THE GLOBAL ATMOSPHERE published in 1999, states that “aircraft line-shaped contrails are estimated to cover about 0.1% of the Earth’s surface” and that the “contrail cover is projected to grow to 0.5% by 2050.” The report also states that contrails tend to warm the Earth’s surface, similar to thin high clouds. Various versions of the chemtrail conspiracy theory have circulated through internet websites and radio programs. In some of the accounts, the chemicals are described as barium and aluminum salts, polymer fibers, thorium, or silicon carbide. In other accounts it is alleged the skies are being seeded with electrical conductive materials as part of a massive electromagnetic superweapons program based around the High Frequency Active Auroral Research Program (HAARP). Those who believe in the conspiracy say the chemtrails are toxic, but the reasons given by those who believe in the conspiracy vary widely, spanning from military weapons testing, chemical population control, to global warming mitigation measures. Federal agencies and scientists have consistently denied that chemtrails exist, insisting the sky tracks are simply persistent contrails. As the chemtrail conspiracy theory spread, federal officials were flooded with angry calls and letters. A multi-agency response to dispel the rumors was published in a 2000 fact sheet by the Environmental Protection Agency (EPA), the Federal Aviation Administration (FAA), the National Aeronautics and Space Administration (NASA) and the National Oceanic and Atmospheric Administration (NOAA), a step many chemtrail believers have interpeted as further evidence of the existence of a government cover-up. 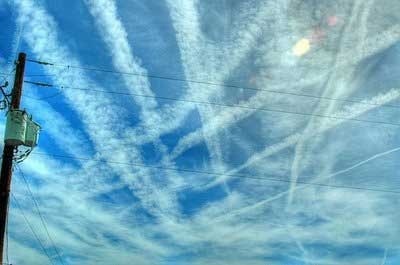 Proponents of the chemtrail theory say that chemtrails can be distinguished from contrails by their long duration, asserting that the chemtrails are those skytracks that persist for as much as a half day or transform into cirrus-like clouds. However, some contrails are visible for several hours according to Contrails facts, a USAF publication. Air Force officials say that long lasting contrails result from certain atmospheric conditions, and their duration and rate of dissipation can be accurately predicted when humidity level and temperature are known. Listed below are links to blogs that reference this entry: Contrails, Chemtrails. This page contains a single entry by Toni published on April 15, 2009 9:08 AM. Codex and corporate lobbyists lunch with our elected officials was the previous entry in this blog. Germany Bans Cultivation of GM Corn is the next entry in this blog.